As they prepare to re-launch the North American leg of “THE WHO HITS 50! TOUR” Saturday, February 27 in Detroit, THE WHO returned to the stage Saturday, February 13 at SSE Arena, Wembley for their first show since the tour was postponed in September (2015). That performance was described by The Telegraph (U.K.) as “high-voltage virtuosity…The Who were in full flight…America’s in for a treat. As these grizzled septuagenarians milked the ovation for their feats of rockin’ physicality like punch-drunk boxers, there were no hard-and-fast goodbyes” (2-14). When THE WHO take the stage in Detroit, it will mark the beginning of a 28-date tour of rescheduled dates from THE WHO’s 2015 trek–which was postponed to allow lead singer Roger Daltrey time to recover from his recent bout with viral meningitis–and includes stops in Toronto, New York, Boston, Chicago, and Los Angeles, before wrapping Sunday, May 29 in Las Vegas. Tickets for the originally scheduled shows will be honored at the new dates. For the tour openers, the band has set Tal Wilkenfeld to perform on the first 13 shows with Slydigs to accompany them on the remaining dates. In addition, 2015 Rock and Roll Hall of Fame inductees Joan Jett & The Blackhearts (who accompanied THE WHO on the first leg of this tour) will perform as special guests at the Thursday, March 3 show at Madison Square Garden in New York City. 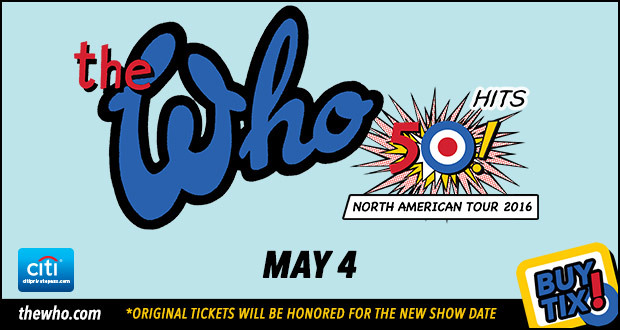 THE WHO HITS 50!” tour is being presented by AEG Live. Tickets and VIP packages for the shows are available at www.thewho.com. Citi is the official credit card of “THE WHO HITS 50!” tour. Citi cardmembers will have access to purchase tickets for the U.S. dates through Citi’s Private Pass Program. For details visit www.citiprivatepass.com.